Lt. Col. Betty Jo (Workman) Wilson Canter, daughter of Howard and Phoebe (Thorpe) Workman of Connellsville, Fayette County, PA, has authored a trilogy of memoirs appearing on Minerd.com. The following story features her grandmother, Clara Jane (Freed) Thorpe. Also see Betty Jo's memoirs of her own military service during World War II, Korean and Vietnam, and of her mother Phoebe (Thorpe) Workman. Clara Jane (Freed) Thorpe was born on Dec. 20, 1876, the first child of Christian Stoner Freed and Esther Resler Barnhouse, Pennsylvania Dutch (German-Deutch) farmers living three or four miles west of Connellsville, PA on top of a beautiful hill in Dunbar Township. Clara Jane was a moderately tall, handsome, reserved and intelligent young woman. She came from a long line of healthy, robust, pioneer type women who, beside their husbands, helped settle the wilderness on first the east and later the west side of the Appalachian mountains of Pennsylvania in the last half of the 1700s and early 1800s. They were women who always bravely "carried their share of the load" under those rugged conditions which faced the early settlers. The Freed ancestors were Mennonites who departed Bavaria, Germany about 1730, probably to get away from religious persecution. They settled in Bucks County, PA near Quakertown before crossing the mountain to settle in Bellevue, Bullskin Twp., three miles north of Connellsville, Fayette County. This last site was only about 10 miles from the home where Clara Jane was born and raised. The Barnhouse ancestors of Clara Jane's mother came from somewhere in Germany and probably settled first in Maryland before coming on to Fayette County, PA, around Chestnut Ridge near Connellsville. Most of her ancestors were educated in the common schools of Pennsylvania, as was Clara Jane. This intelligent young woman had to give up formal school at the fifth or sixth grade level because the closest school was in the village of Liberty and transportation from the farm was very limited as the horses were needed for farming and it was too far to walk in ice and snow. 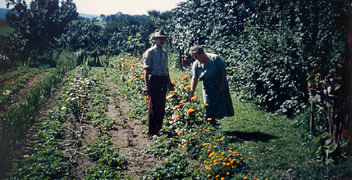 An essential part of her education was acquiring the skills of housekeeping, sewing (she later made all her children's clothing), gardening, raising children (she had three younger sisters and one brother), cooking, use of medicinal herbs and farming (her father specialized in fruit orchards, vegetables and raising bees for honey). In the summer, when farm workload permitted, she played croquet on the lawn with her family and friends, went to "quilting bees," etc. In the winter they were often snowbound and the entire family would sit around a blazing fireplace while their parents read scriptures or other stories to the children. Bowls of reed and yellow apples, popcorn, homemade cookies, hot cider or chocolate were common evening snacks. Clara Jane liked to sing and play the family piano. They all sang and told stories of the old days while mother Esther did needlework. If weather permitted they visited neighbors and played cards. When she was about 17 years old, Clara Jane met young Edwin Thorpe from the village of Liberty located at the bottom of the hill near Vanderbilt, and fell in love. Edwin Thomas Thorpe (one of twins) was born Aug. 22, 1874 at Liberty, Fayette County, PA. The twins were the first sons of John Swayze Thorpe of England (school teacher and later on Pennsylvania and Lake Erie Railroad) and Phoebe Ann Mitchell. The Mitchell parents were of Scotch-Irish origin whose pioneer ancestors also helped settle the wilderness of New Jersey and Pennsylvania as early as the late 1600s and 1700s. Edwin's twin, Edward, died at a very young age. They had two older sisters and later had two younger sisters and two younger brothers. He was educated in the common schools of Dunbar Twp., Liberty, Fayette County, PA. The extent of his education was grade school but he was an excellent mathematician. It also was his good fortune to be growing to manhood at a time when "everyone was inventing" liberating gadgets. (During this period, Thomas Edison invented the transmitter and receiver for the automatic telegraph, the phonograph and the electric light bulb.) Edwin had an intelligent and inquiring mind plus an itch to take things apart and see how they "ticked." He was always inventing some little gadget to help ease household chores. This talent would mature later in his life when he would invent a very useful telegraph key for the P.&L.E Railroad. Edwin spent his summer vacations on the farms of his grandparents, the Thorpes and Mitchells, in Ohiopyle, PA. He also played baseball and was quite a good pitcher. His son in law, Chester Woodward, remembers listening to him tell how he played a "3 and 2 count" -- in Edwin's words, "When I was pitching you knew very well that the next pitch would be a strike because if he wasn't going to get a strike I was going to get him out." In his teens, he learned bookkeeping and by the age of 19 or 20 was working in a grocery store at Liberty, PA.
About this time he fell in love with Clara Jane Freed whom he met at the Presbyterian Church. Since Clara Jane lived on that farm on top of the hill several miles away, Edwin did a lot of walking and hill climbing while he was courting her. He did not own a horse! On Jan. 14, 1895, Edwin, age 20 and Clara Jane, age 18, were married by the Rev. E.R. Johnson at a lovely marriage ceremony at the Christian Freed farm. Edwin lost his mother, Phoebe (who also lived nearby in Liberty) shortly after the wedding. She died in 1897 at age 45. Edwin's sister Cora also was married and lived close by. 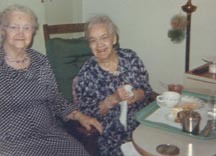 Clara Jane and Cora were very good friends, and one day a week they would have lunch at one or the other's house and chat about things new brides chat about. The Thorpes' first five children, Evaree, Phoebe, Swayze, Esther and Mary were born at the home in Liberty. Daughter Phoebe remembered "living in Liberty in the house on Main Street. The streetcar went right by the house into Dickerson Run and Vanderbilt. 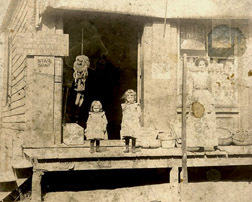 Dad had the grocery store [seen here] and Aunt Mary Agnes Freed (Mom's sister) was Dad's clerk. Aunt Mary stayed with Mom and Dad. We had to travel that path by the store to get to school in Vanderbilt for the first couple of years. Then they built a school just one block from our house." Phoebe's comments continue: "We all went to the Presbyterian Church in Vanderbilt and we were not to wave to them (Freed grandparents) in the church but wait until after the service. Grandma Freed would come for us in the spring wagon in summer and in the horse drawn sled in winter for us to visit them." About 1905, Edwin took a job as a bookkeeper for his uncle, Tilghman Mitchell, at his lumber camp in Ira, Clay County, WV. Mother Clara Jane packed up all five of her children and accompanied father Edwin to their primitive mountain where they lived in a "make shift" house which was cold in the severe winters and often plagued with rats, snakes and other vermin which could get in through cracks in the house. The summers were delightful in the mountain wilderness and all the children ran free, enjoying the beautiful countryside and the excitement of the activities of the lumber mill. Clara Jane was pregnant with her sixth child so it soon became necessary for her to journey to Connellsville, PA with her small children for the birth of her second son Tilghman. After they returned to the lumber mill in Ira, WV, disaster struck several times. First, all the children "came down with diphtheria" and since there was no medical assistance available in the mountains, Clara Jane's knowledge of herbal medicine saved the lives of all her children. (It is said she blew sulphur fumes down their throats.) Secondly, the baby Tilghman scalded both his legs badly when he pulled the coffee pot over. Thirdly, daughter Phoebe cut her foot severely with a cross cut saw. Albeit, the grandparents reported that the older children wrote letters back saying they were "having a grand time." After about two years in West Virginia, the family returned to Liberty, PA. In 1907, father Edwin returned to work for the P.&L.E.R.R at Dickerson Run, PA on the section gang until the company transferred him to Adelaide, PA, as a clerk. He learned telegraphy and in 1908 was assigned ticket agent at P.&L.E. 's Whitsett Junction, at which time he and Clara Jane moved their family to Perryopolis, PA into the house fondly called "the old stone house." In 1909 a Freed reunion was held at Shady Grove Park (seen here) near Uniontown, PA. A photo shows none of the Thorpe family attending. When their daughter Phoebe was asked about this, she said, "We could not get to those reunions or other events at that time because we had no way to travel (no horse and buggy) and small children at home (she was 11 years old)." However, they did many enjoyable things at home. After the move to the "old stone house," Clara Jane, like her mother Esther, enjoyed family gatherings at her home. Each year on father Edwin's birthday, Clara would invite all the Thorpe relatives for a picnic dinner on the lawn. At other times she would have a gathering of the Freed clan. Many extant photos confirm this. Their daughter Mary said, "Holidays were always momentous occasions. At Easter, Mom and Dad would hide eggs (colored red with the juice of boiled onion skins) all over the yard in nests which we thought were bunnies' nests. At Christmas we strung popcorn and cranberries for decorations and made colored paper cornucopias for tree trimmings. The young ones always believed in Santa Claus and we furnished 'evidence" of his having been there." This informative statement demonstrates what loving parents Clara Jane and Edwin were. Edwin was jovial and very much an extrovert but he had a quick temper and was a strict disciplinarian. He did not "spare the rod." He was seldom home after he became ticket agent for the P.&.L.E. at Whitsett Junction. His hours were long -- up at 4 a.m. to walk to work and walk home in the evening. He only had time to eat dinner, discipline the children and early to bed. He followed this routine until he retired at age 65. His work schedule left most of the care of the home and children to mother Clara Jane who managed the household with great efficiency. Everywhere the family lived, they always had a garden, several pigs, two cows and chickens. Mother Clara had a "thousand" things to do but always managed to maintain her cheerful, even disposition. Daughter Mary remembers mother Clara ironing their clothes and telling the children stories as she ironed. She usually finished this chore with a game, saying: "I have found it! I have found it!" What had she found? "The last piece of ironing!" Friends and family were always welcome in her house. It was during this period that Clara took Edwin's aunt, Edith Coughanour, into her home when she was terminally ill. In 1912 disaster struck the Thorpe family again when they lost their three-year-old son, Franklin, in death from an "infant's summer disease" which the doctor called cholera infantum. Frank had never really recovered from whooping cough at an earlier age so apparently was not strong enough to resist the final illness. In that same year a fourth son, Edwin Jr., was born. Clara had little time for mourning. 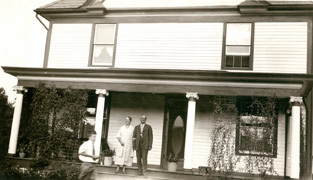 There seems to be some confusion as to the date of moving from the "old stone house" to the brick house but in the time span of 1912 to 1918 the last son, Roy, and daughter Ruth, were born and the move was accomplished to the new home. About 1923-24 [about the time Clara Jane's mother died], Edwin and Clara Jane moved the family again, this time to a farm (Browneller place, seen here) on Route 51, a few miles outside of Perryopolis, where they ran a fresh milk dairy. They had as many as 12 cows in their herd. In June 1927, daughter Mary graduated from Westminster College and mother Clara Jane traveled to New Wilmington, PA for her graduation. Clara Jane was concerned that with her lack of formal education, she would feel inadequate in the world of academia. Daughter Mary remembers Mrs. Russel saying, "Mary, your mother is a naturally educated person." Everyone found her most charming. Father Edwin was still working long hours as a ticket agent on the P.&L.E.R.R. Son Tilghman was in his teens -- old enough to manage the dairy under mother Clara's direction with some help from the three younger children. The dairy was discontinued after a few years when the Federal Government imposed stricter regulations on dairymen. The cost of rebuilding the dairy was prohibitive. 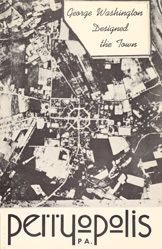 The dairy was replaced with the selling of chicken products. During this period, mother Clara Jane's aging father, Christian S. Freed, spent some of his later years in her home. He died in 1934. 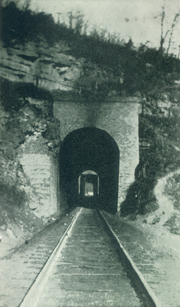 Seen here, the Washington Run Railroad Tunnel in Perryopolis, from an old postcard. Mother Clara Jane's children were growing to adulthood but she continued to have her home full of childish laughter by inviting her grandchildren for summer vacations. This author [granddaughter Betty Jo] well remembers at age 9, "traveling to the grandparents' farm via the railroad from Connellsville to Wickhaven depot with her younger brother and sister (Howard and Ethel Mae) -- being frightened because it was the first trip away from home unaccompanied by parents -- being met at the train station by Grandmother Clara's children, Mary (home on vacation), Roy and Ruth who had driven from the farm to the depot in a little pony cart to pick up their nieces and nephew -- arriving back at the farm where grandmother Clara Jane was waiting to welcome us with some of her icy cold root beer and her specialty of freshly baked cinnamon rolls. She quickly made us feel safe and secure again." M.J. recalled that Clara always had an ample supply of homemade candies and cookies on hand so that there was plenty for all, even if they dropped in unexpectedly. Edwin always had a supply of big shiny 50-cent pieces or silver dollars on hand for his great grandchildren and would do "coin tricks" for them. Needless to say, all the children wanted to visit their great grandparents as often as possible. Clara's son Tilghman well remembers his traveling about 20 miles to Coalbrook, near Connellsville, PA, to buy that cart and the pony and driving it all the way home. It took all day. While they were living on the farm, they invested in an old Ford car. Son Tilghman learned to drive to deliver the milk and take the younger children to school in Perryopolis. Daughter Ruth remembers the car had so little power it would stall on the hill and they would have to drive in reverse to get up the hill to get to school on time. Of course, the roads were unpaved and they struggled through muddy ruts during wet weather periods. In 1933, father Edwin retired from his work with the P. & L.E.R.R. Soon after, they moved from the farm and bought a home in the village of Perryopolis, PA. Here, mother Clara Jane now had electricity and all the modern conveniences. Life was much easier for her and about this time daughter Mary gave her an electric sewing machine and washing machine. It was about this time when granddaughter Mary Jane remembers coming from her parents' farm for visits with her grandparents in the summer. Grandma Clara Jane would invite the cousins who lived in Perryopolis that were near her age to play every day and plan activities (Evaree's daughter Lois Ruth and Swayze's children Leah Katherine and Ralph). Grandpa Edwin would take her to Swayze's store with him and give her dimes and nickels to buy "goodies." Every year, Grandma Clara would have a birthday party for Mary Jane and invite all the cousins and neighboring children. The thing that made it so memorable was that Grandma Clara had her dates mixed (having oodles of grandchildren) an always celebrated it exactly one month ahead of Mary Jane's real birthday. All of the children were instructed not to let Grandma know that she had the wrong date so as not to hurt her feelings! Mary Jane, of course, enjoyed it very much since she got two birthday parties a year as a result. Father Edwin's religious philosophy during his middle adult years was to lead a good Christian life but he often said it was not necessary to go to church to accomplish this goal. It was only in his retirement years that his son Swayze talked him into getting re-involved in church activities where he had been active in his youth at East Liberty. Clara Jane was busy taking her first driving lessons at age 63. She and Edwin had a car in their garage which was not being driven after their children left home. She passed her tests but her family dissuaded her from driving. They were afraid for her safety so the car was sold. 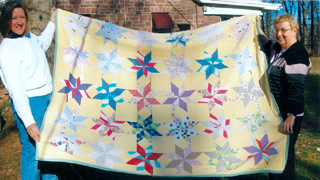 Clara fashioned this quilt in 1954 as a wedding gift for her granddaughter Leah Thorpe and husband Fred Page. Seen here, Leah and their daughter Carol display the creation some half-century later. Click to see a larger view of the quilt in our Online Quilt Museum. At the advanced age of 89, grandfather Edwin died on Jan. 3, 1964. All of his life he had always enjoyed the respect and goodwill of his fellow neighbors and family. He was a member of the Ancient Order of the Knights of Malta and a lifetime member of the East Liberty Presbyterian Church. He was an ardent Republican until President Franklin D. Roosevelt came into office, at which time he became a Democrat for the remainder of his life. Clara Jane continued to be very active most of the years she lived in the Methodist Home. She continued with her church work, needlework and visiting her family. She traveled to Florida by train by herself to visit her brother Walter Freed and her sisters Sarah Freed and Mary Agnes Oswald. Walter took her on an extended tour of the entire state of Florida. At about age 85 her daughter Mary took her on her first plane ride when she again traveled to Florida to visit her sisters Sarah and Mary, her daughter Esther and grandchildren. Clara Jane had a lovely visit but she didn't like flying. Clara Jane died at age 97 on Oct. 21, 1973, having borne 10 children -- nine living to adulthood -- all graduated from high school. The three oldest daughters attended "normal" school and became teachers in the local grade schools; her daughter Mary graduated from Westminster Liberal Arts College, her son Edwin graduated from Boston University and her youngest child Ruth attended Geneva College. Her daughter Mary said, "I think our zeal for more learning of many kinds comes from our mother who, though not formally educated past the sixth grade, was consistently asking and learning as her children developed and studied. She was always willing to try new things and continued to be interested in the business of living and using her time and talents wisely." Copyright © 1982 Betty Jo (Workman) Canter. Republished with permission.